Water and children - How much should your child be drinking? Did you know that your child should be drinking between two and three pints of water – a day? And that juice, cordial and soda doesn’t count whatsoever? 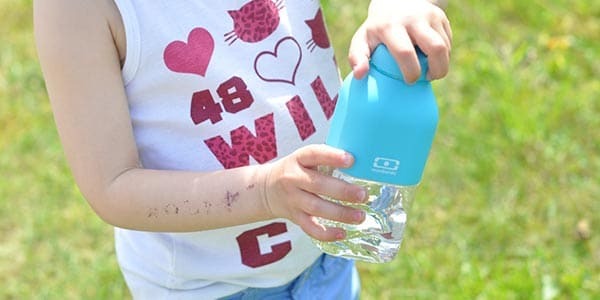 Read on to find out why it’s so important that the kids get enough water, and get some concrete tips on how to get them to drink more! It’s actually quite hard to believe that I don’t dream about water when I sleep! Because in my everyday life, water plays a fairly large role. And not just on those especially hot days, but the majority of the time really. Water plays a big part in my everyday life, because I have a boy who just doesn’t drink enough water during the day. Because of that, I’ve taken on the role of Water Whipper, constantly placing a glass of water in front of his face, hoping to get those mythical 1200 mls into him, which is what he according to our family GP needs (and that’s a lot, if you ask me)! And if I’m honest, I’m getting a bit tired of this Water Whipper-role, and sometimes find myself doubting the whole project of: Drink water, water, and more water. But there IS a good reason for making sure the kids get enough water. So below you (and I!) will get a refresher on the arguments as well as a few good tips for how we can easily get some more of that vital water into the kids. As you may know, the body consists of 65% water, and it’s important that this balance is maintained, to keep the body and brain functioning optimally throughout a busy school or daycare-day. If a child – or adult, for that matter – doesn’t get enough fluids, it can result in headaches, lowered concentration and dizziness. As the body loses between 4 and 5 pints of fluids every day through breathing, perspiration and urination, naturally something needs to come in the other end to maintain this balance. We get roughly half of these fluids back into our bodies via food and natural chemical processes in the body, but the other half – that is, between 2 and 3 pints – we get through what we drink. So if you’re only putting away a pint, the body is short quite a bit of fluid! A rule of thumb is, that school children need between 2 and 3 pints of fluids every day. This of course varies based on the child’s weight, how much the child sweats and the level of physical activity. One pint of soda – a week! But all fluids are not created equal, and so it doesn’t count if these fluids take the form of 2-3 pints of soda or juice being poured into the kids. Studies show that every fifth 7-year old in Denmark exceeds the recommended weekly soft drink intake. And I must admit, I was a bit surprised to see just how little soft drinks and juices should be drinking, according to the official recommendations. Even if children eat healthy and exercise at least 60 minutes every single day, soft drinks aren’t recommended at all for any children younger than 3! For 3-year olds the limit is 250 ml of soft drinks or juice a week, and for kids between 7 and 15, the limit is 500 ml of soft drinks or juice – again in a full week. So even though it undoubtedly would be much easier for me as the “Water Whipper” to get some juice or soft drink into the boy, it probably isn’t the best way of achieving the 1200 ml of fluids a day. Instead of soft drinks and juices, they need to be drinking water – lots of water. It’s unquestionably the best way to quench their thirst, and it’s always accessible. In the UK our tap water must comply with European legislation and frequent testing, and boasts an almost 100% compliance rate throughout the UK, and tap water is both cheap and contains important minerals such as calcium and magnesium. In my attempt to make my role of water whipper a bit more bearable, I’ve come up with the following ideas that get the water flowing a bit more easily, and the boy (and hopefully your kids too) to drink more! Always have a jug of water in the fridge, optionally with cucumber, lemon or strawberry slices added. It adds flavour and looks lovely in the jug. Freeze assorted berries (blueberries, strawberries, raspberries, etc.) and use as ice cubes – it makes a glass of water more fun. And all that’s left to say is, happy drinking! Remember to look after our water, as it’s actually quite unique to be able to simply turn on the tap and enjoy the vital drops. And we’d like it to still be that way when the kids are grown!